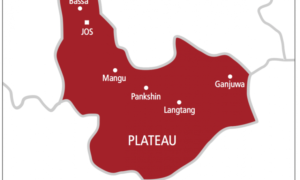 SPEECH OF THE EXECUTIVE GOVERNOR OF PLATEAU STATE, RT. HON. 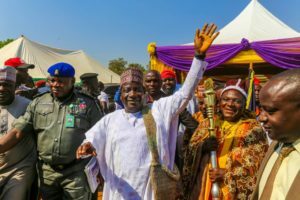 (DR.) SIMON BAKO LALONG AT THE INSTALLATION AND PRESENTATION OF FIRST CLASS STAFF OF OFFICE TO THE ATAR ATEN OF GANAWURI, HIS ROYAL HIGHNESS, YAKUBU CHAIMANG ON WEDNESDAY 28TH NOVEMBER 2018 AT THE EKAN PRIMARY SCHOOL PLAYGROUND, GANAWURI. It is my great pleasure to address you today on this auspicious occasion of the installation and presentation of 1st Class Staff of Office to the Atar Aten of Ganawuri, His Royal Highness, Yakubu Chaimang. This historic occasion offers the opportunity to share in the celebration of the moment and for us to witness the rich cultural exhibition of the Aten Nation. The Aten Nation may look or sound small, but its people are historically and culturally mighty. Most significantly is your high sense of accommodation and tolerance for all shades of humanity, hence your collective sense of unity and purpose. I recall with nostalgia that during the pre-election period of 2015 the people of Ganawuri Chiefdom welcomed and hosted me with great hospitality and ovation. This support was further consolidated in your resounding turn out and massively voted for the APC during the elections. The Rescue Administration’s core mandate is to give the good people of Plateau a sense of communality through the guarantee of security, peace and good governance, which are key in our Five Policy Thrust. It was on this note that in my Special Broadcast of 14th August 2018, I reiterated Government’s commitment in addressing the issue of creation of Chiefdoms, Districts, village Areas and review of salaries and welfare packages for traditional rulers in the State. Accordingly, Government considered and approved the upgrading and restoration of new chiefdoms in the State that saw the Atar Aten of Ganawuri’s stool upgraded to a 1st Class Status. Let me reiterate that my interest in the creation of chiefdoms and the recognition of traditional institutions is to give communities in the State a pride of place, based on the uniqueness of their ethnic identities, which is the foundation they build their orientation for community life. This is significant because what they give to the larger society is a reflection of the value of what they have been nurtured with. I have no doubt in the integrity and commitment of the Atar Aten to lead his other fellow Council members of Chiefs in Unity for a stable and peaceful coexistence with their neighbours. 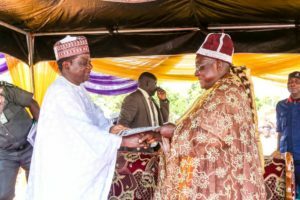 On this note, on behalf of the good people of Plateau State, I heartily congratulate His Royal Highness, Yakubu Chaimang on this well-deserved installation ceremony and presentation of First Class Staff of Office as Atar Aten of Ganawuri Chiefdom. 1) You are first and foremost Custodian of Culture, History and Moral or Religious Values. These are essential ingredients of building unity and harmony, given our varied dialects and tribes on the Plateau. 2) You must play great role in mobilization of your subjects, especially the youth in Commerce, Agriculture and community development. 3) You are to play the role of a strategic and effective mediator in Alternative Dispute Resolution (ADR), particularly on land and boundary issues, in concert with your Council of Elders. You are therefore expected to be proactive in monitoring events and should be able to pre-empt violent attacks, communal crisis, criminal tendencies, amongst other vices. 4) You must play critical role in community policing, since you know your terrains and virtually every member of the community. In carrying out your tasks, you are to uphold truth and advise on varied matters as security officers of your domains. 5) Above all, with the recognition and empowerment accorded you, government will hold you responsible for failure to exhibit duty of care to your subjects and the society in general. I am aware that these charges can be awesome, but the burden of leadership demands taking and sharing responsibilities. Government on its part will continue to ensure that conducive environment is provided across the State for sustainable service delivery as well as protection of lives and properties. The Aten Nation cannot be an exception, and it is in recognition of this that Government approved the award of the reconstruction of Tahoss – Ganawuri Road and the spur to Koronfang and Dahreng. We are also funding the drilling of boreholes, water supply and sanitary works within Riyom Local Government and Ganawuri is a beneficiary. The State Government is currently liaising with the Federal Government for the Construction and Maintenance of Federal roads in the State including the Vom – Ganawuri – Manchok road that passes through this Community. I am also aware of the problems the community is facing with the supply of electricity for over two years, due to lack of connection to the National Grid as your only source of supply is from NESCO. I assure you that as a matter of urgency, the Ministry of Water Resource and Energy will come up with the assessment and cost estimate for connection of Ganawuri to the 33KVA National Grid through Miango. It is hoped that these new creations, restoration and re-grading across the State, which is a continuous process will bring greater confidence and assurance to the citizenry of our collective resolve to remain united and pursue common development goals. Accordingly, I wish to solicit your continuous loyalty and support to enable Government continue serving you better. 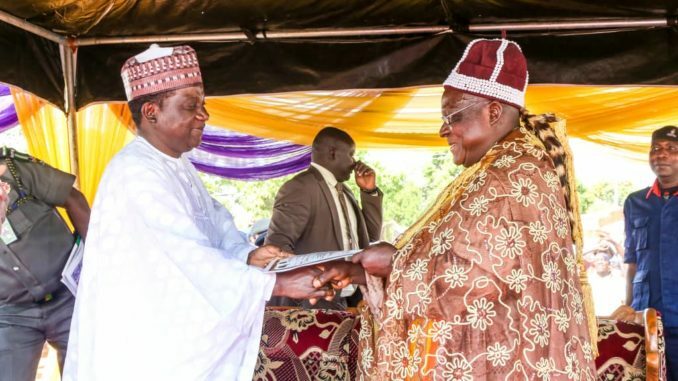 On behalf of the Government and good people of Plateau State, I wish to further call on all and sundry to cooperate and support His Royal Highness in his usual bid for purposeful leadership and direction, engender peace and harmony in your domain, while we submit to God our prayers for strength, good health and wisdom that will enable him succeed in the task ahead. Thank you all for your kind attention and may God continue to bless Plateau State.